The Lord is the Supreme Soul of everyone. He is pleased with those who behave respectfully toward superiors, make friends with equals and show mercy to inferiors. When the Lord is pleased with someone that person will not remain bound by the influence of material nature, but will attain a spiritual position, where everything is comprised of happiness and bliss. The Lord is unmanifest, omnipotent and self-existent. Everything always remains under His control. He is the Supreme Shelter of all the living entities of this world. Therefore you should take shelter in the Lord with all your heart." His Holiness Swami B. B. Tirtha was born in 1924 in Assam, India. After completing his MA in philosophy at Calcutta University in 1947, he came in contact with his spiritual master, Sri Srila Bhakti Dayita Madhava Gosvami Maharaja. He was then initiated into the Gaudiya Vaisnava school of Bhakti yoga propagated by Sri Caitanya Mahaprabhu, the 15th century master of devotional ecstasy. Since then, he has been a full-time monk. After his spiritual master left this world in 1979 to participate in the eternal lila of Sri Krsna, Srila Tirtha Maharaja became the President of Sri Caitanya Gaudiya Matha, which has over twenty asramas in India alone. Since 1997, His Holiness has been traveling the globe several months a year, enlivening all who come in contact with his sweet personality and message of divine love. To date, his books in English include Suddha Bhakti, Sages of Ancient India, Sri Chaitanya: His Life and Associates and the present volume, A Taste of Transcendence. Sages of Ancient India-The Sacred Teachings of Dhruva and Prahlad is the English rendering of two Bengali narrations, which were compiled by His Holiness Srila Bhakti Ballabh Tirtha Maharaj in 1971. The stories of Dhruva Maharaj and Prahlad Maharaj originally occur in the greatest of Indian scriptures, Srimad Bhagavatam, which elaborates upon the science of full-fledged theism. Therein is recounted how Dhruva and Prahlad devoted themselves to God, how they dealt with difficulties on their spiritual paths and how they finally achieved self-realization by the grace of the Lord. Especially in these modern days, when many people tend to invent new and, for the most part, watered-down ideas about spirituality, it seems important to publish works that shed light on the teachings of the great saints of the past. If we study these teachings carefully, we will find that they contain universal truths that apply to all times and ages. Such is the case with Sages of Ancient India. Although these stories may contain elements that the modern mind would deem mythological, the underlying spiritual message remains a powerful one. As such, this book is more concerned with transcendental truth than with empirical fact. 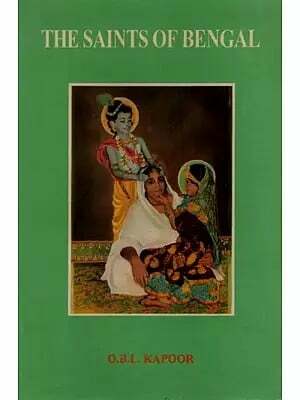 The prefaces to the first, second and third Bengali editions of this work were written by the renowned Vaisnava saint, His Holiness Srila Bhakti Promode Puri Goswami, who disappeared from our mortal vision in 1999. For the sake of readability we have condensed these three separate prefaces into one foreword. For the same reason we have omitted the many beautiful Sanskrit verses that originally occurred in them. Since we are aware that people who are unfamiliar with the spiritual heritage of ancient India may have difficulty in understanding the technical Sanskrit vocabulary, we have explained some key words in the glossary. We hope this book will prove to be an inspiration for all those who pursue the spiritual path. The stories of Dhruva Maharaj and Prahlad Maharaj are now appearing in the form of a book due to the unlimited mercy of Sri Guru, Sri Gauranga and Sri Sri Radha-Nayana-Natha. This is giving us great pleasure. 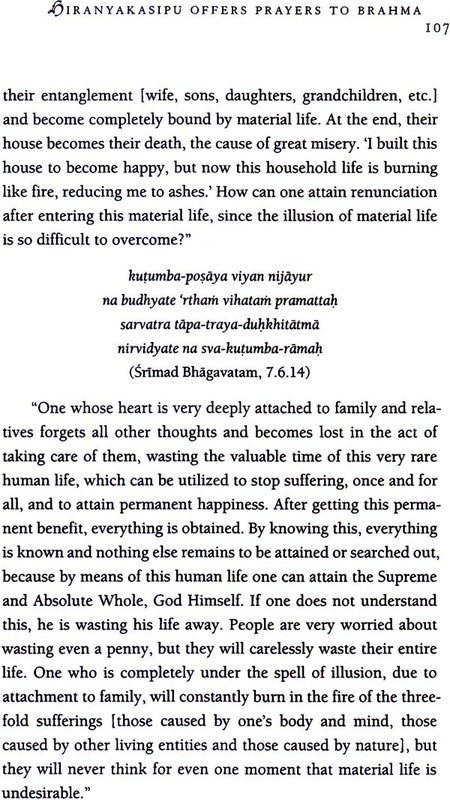 Previously these narrations appeared in the form of articles in several issues of our devotional magazine, Sri Chaitanya Vani Patrika. At the repeated request of many devotees, who wanted to disseminate these stories on a grand scale, it was decided to publish them in the form of a booklet. When Sriman Mahaprabhu was residing at Gambhira in Jagannatha Puri after taking sannyasa, He listened innumerable times to the stories of Dhruva and Prahlad from His intimate associate, Srila Gadadhara Pandit Goswami. Thus He showed us by His personal example that we should listen very carefully to these narrations again and again. This does not only apply to adults, but to the innocent children as well. We would like these stories to be read to them by their parents, guardians, schoolteachers and well-wishers, because they contain many important teachings regarding the path of devotion. The holy life of Dhruva exemplifies devotion that was at first tinged with elements of personal desire and then blossomed to complete purity, while the holy life of Prahlad exemplifies devotion that was pure from the onset. Prahlad’s worshipable Lord was Sri Krsnacandra in the form of Nrsimha avatara, while Dhruva worshiped that same Krishna in the form of the lotus-eyed Lord Sri Hari, four-armed Vishnu, holding conch-shell, disc, club and lotus. Actually there is no difference in tattva (spiritual essence) between the form of Narayana (Vishnu) and that of Krishna, yet in the form of Sri Krishna we find the greater amount of love mellows. We can observe that, among the nine forms of devotional service, Prahlad was able to attain the Lord by engaging in the process of remembering Him. Dhruva’s devotion, however, was mixed with the practice of yoga. Devarsi Narada could understand that Dhruva desired to reach a position that had been impossible to attain even by his father and grandfather before him, and he knew that Dhruva’s mother had suggested to him that the best way to reach his goal was to worship the Lord by performing yoga. Hence, Dhruva went to Madhuvana, the best among the twelve forests of Vrndavana, and purified himself by bathing three times a day in the holy Yamuna River. On the bank of the Yamuna, Dhruva prepared a suitable sitting place and practiced pranayama by controlling the inhalation, exhalation and retention of his breath, by fixing his consciousness on Lord Vasudeva and by meditating upon and visualizing the very powerful and secret twelve-syllable mantra. He also worshiped Lord Vasudeva with proper puja articles, all according to the instructions of Narada Muni. That place in Madhuvana, near Mathura, where Dhruva prepared his asana, is called “Dhruva-tila” (“Dhruva’s hill”). Pilgrimages are made there during the first day of Vrajamandala Parikrama. Since the Lord is the Supreme Soul and Internal Guru of everyone, He knew the desire of Dhruva’s heart and arranged for him to meet a devotee teacher in the form of Narada Muni. Devarsi Narada gave him initiation into the mantra and instructed him on the practice of devotional service. After duly receiving initiation, Dhruva surrendered with great faith to the instructions of his spiritual master and, following a path of firm renunciation, obtained the personal presence of the Lord after having worshiped Him for six months. Sri Hari, who is very affectionate to His devotees and eagerly fulfills their desires, knew Dhruva's strong determination and touched the forehead of His devotee with His Panchajanya, the divine conch-shell that bestows pure knowledge. Then Dhruva, in a state of devotional ecstasy, started to compose beautiful verses. Although he was still an illiterate child, these verses are difficult to understand even for great scholars. Dhruva’s prayers express the gradual detachment from his previous material desires, despite the Lord having agreed to fulfill his wish for opulence by granting him the planet Dhruva-loka, the topmost position above all the three worlds. This planet is in the center of the orbits of the Seven Rsis, the forest hermits and all the stars, including the abodes of the demigods like Dharma, Agni, Kasyapa and Indra. Although situated within the material universe, Dhruvaloka is a very unique place-a spiritual planet. It is the residence of Sri Hari, like Svetadvipa, Mathura, Dvaraka and so on. This planet is not subject to destruction even at the time of the great cosmic annihilation. The Lord gave Dhruva dominion over his father’s kingdom for 36,000 years. By worshiping the Lord with the performance of the daksina-bahula yajna, Dhruva obtained great material pleasures, and at the end of his earthly reign he had the good fortune to reach the supreme destination. The Lord said, “At the end you will be able to reach My supreme abode-My own planet, situated above the abodes of the Rsis, which is considered worshipable by all other planets. Those saints who reach that place will never fall down from there”. The Lord, who is very affectionate to His devotees, granted Dhruva the supreme destination, but He did not give the same blessing to his stepbrother, Uttama, and his stepmother, Suruci, who had committed offenses. Uttama was killed by the Yaksas while he was hunting in the forest, and Suruci died in a forest fire while searching for him. Sva-karma phala bhuk puman: everyone reaps the fruits of his own activities. 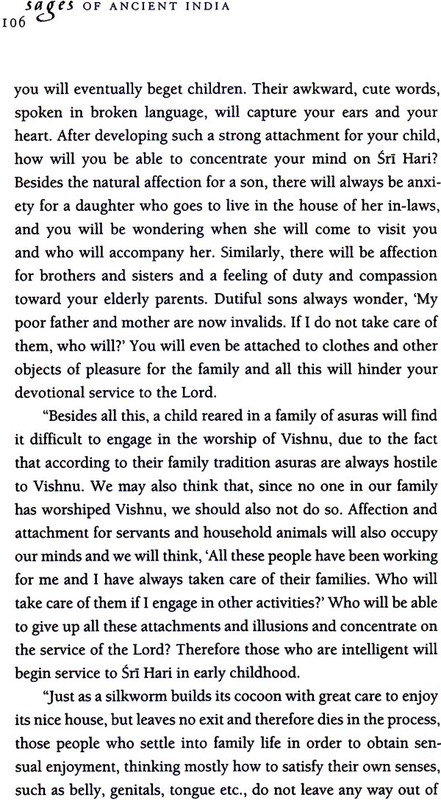 The piety and devotion of Suniti Devi, the mother of Dhruva and the jewel amongst all mothers, is so extraordinary. Although she could well understand the hateful words that her co-wife Suruci had hurled at the little child she had fed at her breast, she told him, “Dear boy, you should not think that your troubles are coming from Some other person, because every-one in this life simply gets the same sufferings which he had inflicted upon others in previous lifetimes. If you want to sit on the king’s throne like Uttama, you should give up all your hostile thoughts and follow your stepmother’s advice, dedicating yourself to the worship of Lord Hari. Her words were true, so you should sincerely do what she said”. Suniti had given up all hatred and instructed her son to worship the Lord. Dhruva eagerly accepted his mother’s words and, with her permission, left to execute her instructions. Such was the extent of Suniti’s surrender to the Lord. What mother would be able to allow her beloved little child, the baby she had carried in her womb, to go to the forest to worship the Lord? This world would be so peaceful if all mothers were to follow the example of this great woman. There would be perfect peace on the face of the Earth. And how much suffering King Uttan-apada bore for having ill-treated his son! Therefore the Lord, who is affectionate to His devotees, also blessed them with the supreme destination. If someone tastes a little of the nectar of Krishna consciousness, he will naturally forget everything else, just as by eating a small quantity of sweets one’s appetite is completely satiated. We fondly desire that this book will be widely distributed.